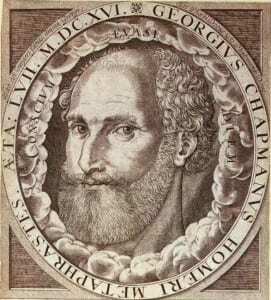 George Chapman, whose career spanned the Elizabethan and Jacobean periods, was a significant man of letters – classical scholar, poet, playwright and translator. Chapman is also thought to be the rival poet of the ‘rival poet’ sequence in Shakespeare’s sonnets (78-86) vying for the patronage of the Earl of Southampton. The London theatre community was tight-knit and Shakespeare and Chapman would have known each other, especially as they both knew and worked for part of their careers for Philip Henslowe. Shakespeare was highly regarded in that community as an effective and successful playwright from the point of view of getting the audiences in. Chapman was also highly regarded, but in a different way: he was seen as a man of superior education and intellect. Although collaboration among writers in that community was the main method of producing plays fast, and Shakespeare was fully involved in that, Chapman was somewhat aloof, although he wrote one play, Eastward Ho, in collaboration with his friend, Ben Jonson, and John Marston. It almost landed them in jail as it contained a few satirical lines about the Scots. Jonson and Chapman wriggled out of it by writing sycophantic letters to the king. In one they blamed Marston for the offending lines. There is no evidence of Shakespeare and Chapman having collaborated on any plays. Chapman’s plays, both comedies and tragedies, were influential on the work of other playwrights. For example, Jonson’s Every Man in his Humour and Every Man Out of his Humour were based on Chapman’s An Humorous Day’s Mirth. Chapman was virtually the inventor of the tragicomedy form that became a standard theatrical entertainment among Jacobean writers, developed and matured by Beaumont and Fletcher. The masque became one of the most popular forms of the theatrical experience in the Jacobean era. Chapman wrote one of the most successful masques, The Memorable Masque of the Middle Temple and Lincoln’s Inn, performed on 15 February 1613. Chapman died in 1634 and was buried in the Church of St Giles in London. The tombstone was designed by his friend, Inigo Jones.